Marsh Off-site Process Calibration capabilities - Burlington Lab. MARSH calibrates temperature controllers, deadweight testers and other precision instruments to NIST / NRC standards. This ensures that your instrument is not only repaired but also meets manufacturer's specifications. 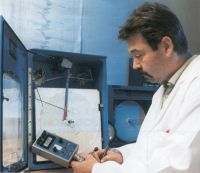 MARSH provides a written Certificate and Report of Calibration. Any Audit of your plant equipment will require these documents. Tremendous precision at no extra cost. Field Calibration; we come to your site to address your needs. MARSH provides instrumentation calibration services in keeping with the standards set by the International Standards Association (ISO). With each calibration we provide a Report of Calibration. Check with Customer Service to ensure that a NIST / NRC traceable Certificate of Calibration can be issued for your particular item. We provide all the required Documentation and NIST / NRC Traceable Certificates of Calibration to meet or exceed all your internal and external audits. MARSH can also assist you or completely setup your own Calibration Program. With each job, we provide a Report of Calibration, with as found and as left values stated, listing all data points, all pre-cal and post-cal data, and all tolerances relative to that item. MARSH provides instrumentation repair services as well as calibration services in keeping with the standards set by the International Standards Organization (ISO). If an item needs repair, then it is repaired as well as calibrated. With each repair, we provide a Service Report detailing the problem and corrective action taken.